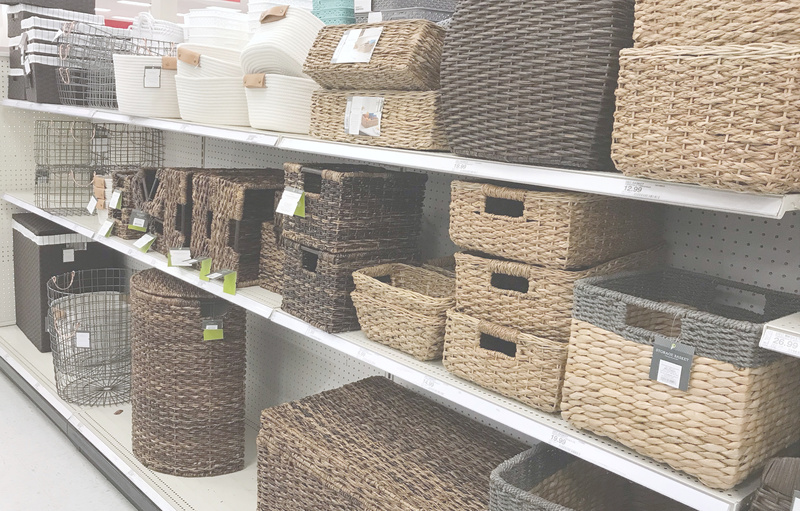 When people think about getting organized, often one of the first things that comes to mind are organizing products; those matching bins and basket arranged neatly on shelves, adorably hiding your odds and ends and containing your stuff. 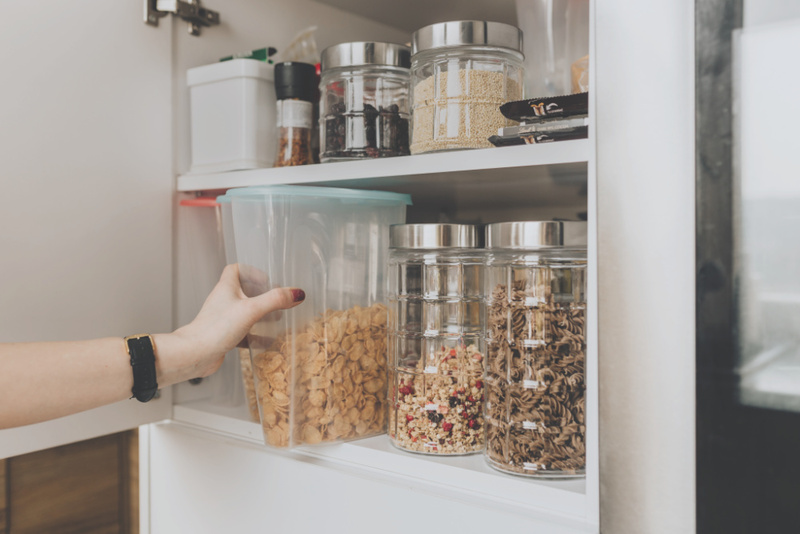 Motivated by the idea of finally tackling that hot spot in your home, you race to the store to find the cutest containers to “organize” your space. You rush home and throw these new beauties at your stuff and – ta-da! – you are organized! The problem is: the “containerizing first” approach to organizing never lasts. 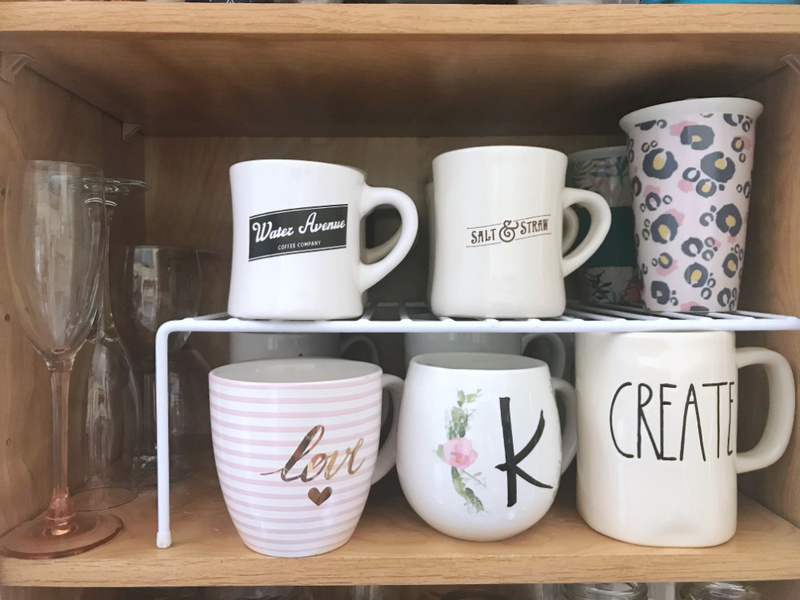 You forget where you stashed things away, you had to force-fit a few items, and lo-and-behold: your cute new products didn’t actually solve a problem. In fact, they may have added MORE clutter to your life! Organizing products don’t make you organized. In fact, they may have added MORE clutter to your life! Sound familiar? You’re not alone! Over the past 20 years, we’ve found that, nearly every home has had an “abandoned organizing product” area in the garage or storage room! Good intentions went awry and good money was wasted. Now let’s be clear, as professional organizers, we love attractive bins as much as anyone else. In fact, we love hip products so much that Restoring Order has our own line of branded desktop organizing products! Yet, we’ve also been around long enough to know that organizing products alone do not make you organized! To avoid buying products you’ll never use (or use and abandon), you must be sure you’re getting the best organizing product for your project. 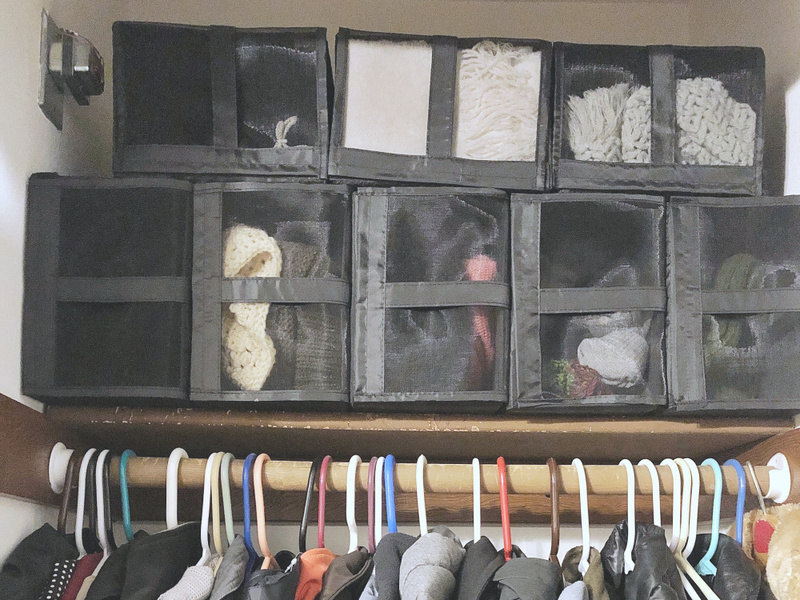 I’m going to show you IF, WHEN, and HOW to use organizing products so you can end the overuse and abuse! Most commonly, organizing products are used in lieu of an organizing PROCESS. Anyone can find a bin, shove stuff in it, and tuck it in a closet or on a shelf. 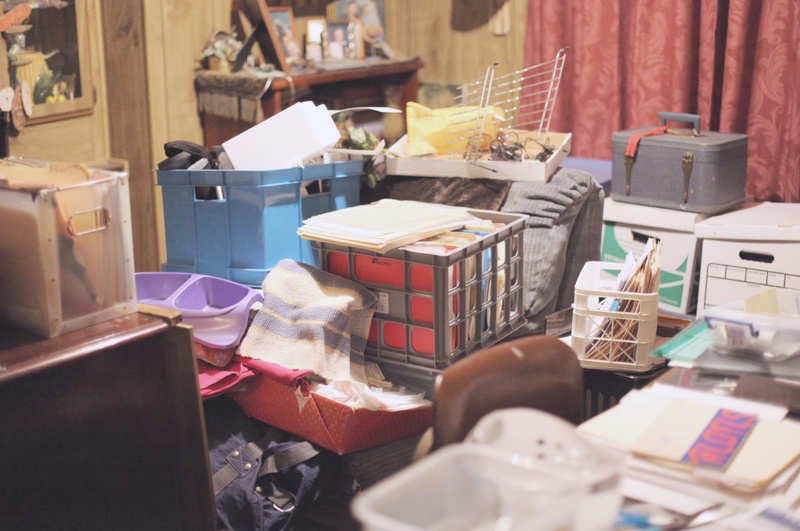 But, if you lack a sound organizing process, all you’ve done is containerize your stuff. Don’t sacrifice a sound organizing process for a quick fix. Good organizing begins with identifying your priorities and building systems that support you in fulfilling those. Simply containing stuff isn’t true organizing. Follow this process to determine IF you need organizing products in your project. 1. First, PURPOSE the space. 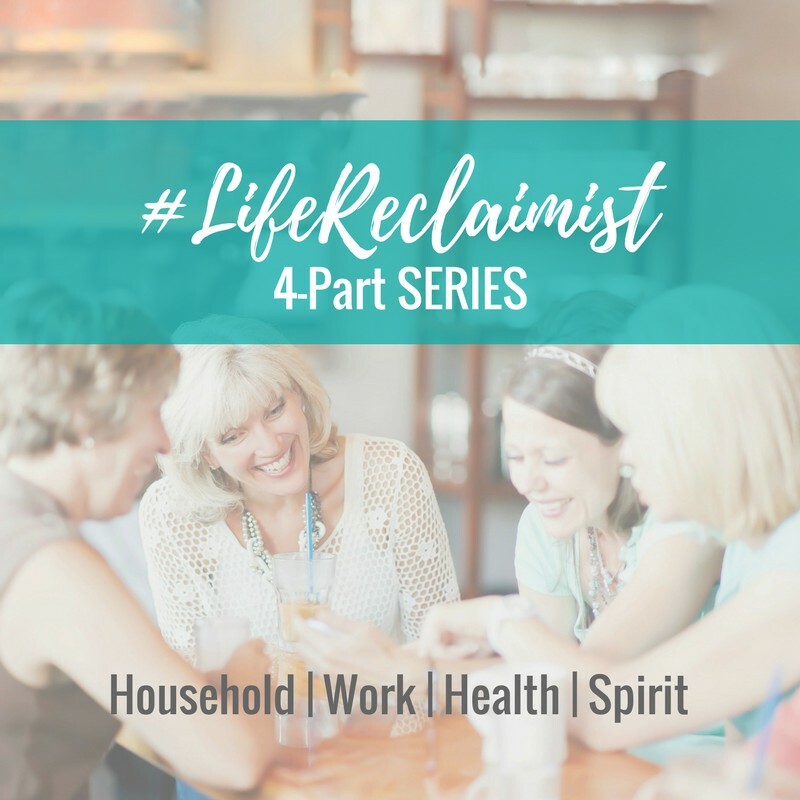 We’ve discussed purposing your space -assigning an intentional theme to a space – at length here. 2. Next, SORT and PRUNE your belongings. Often at least some of what you’re wanting to contain isn’t needed after all. Read more on The Pruning Principle and how it can help you get organized for good here. 3. 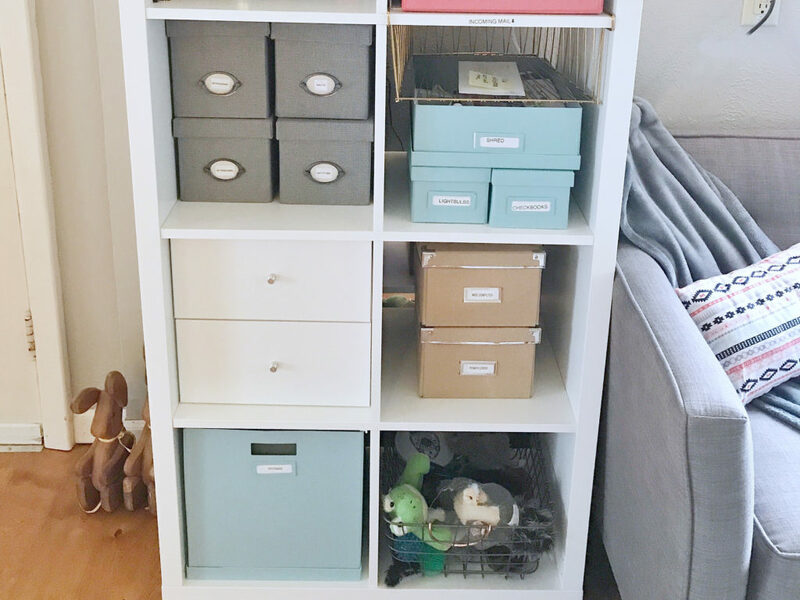 Once you’ve sorted and pruned your items down to what you really want and what agrees with the purpose you’ve assigned to the space, then take an INVENTORY, which is the volume of each kind of item you’ve sorted. Measure the categories of items (actually find rough dimensions) to determine the size of storage needed for your specific inventory. 4. Determine the DESTINATION SPACE. 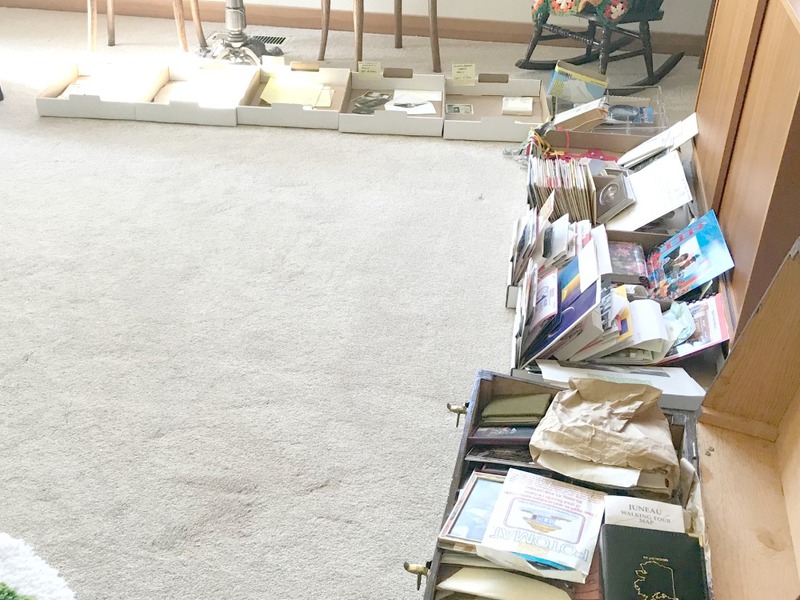 When you’ve decided where you’d like to store your inventory, measure the space! This step is so important and often over-looked. 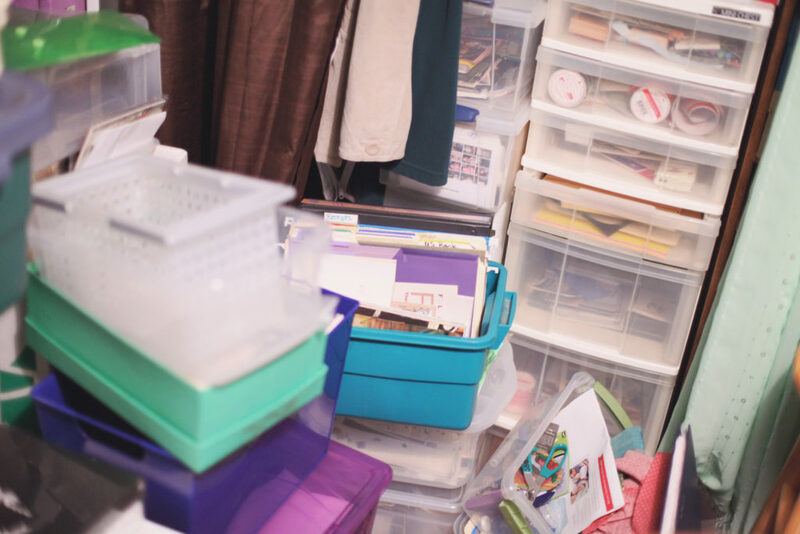 Measuring your space and your inventory will help you avoid purchasing the wrong product and ending up with the good intention graveyard of plastic in your garage. After following these steps comes the hard part…PATIENCE. When it comes to organizing, most folks want a quick fix and settle for band-aid solutions. 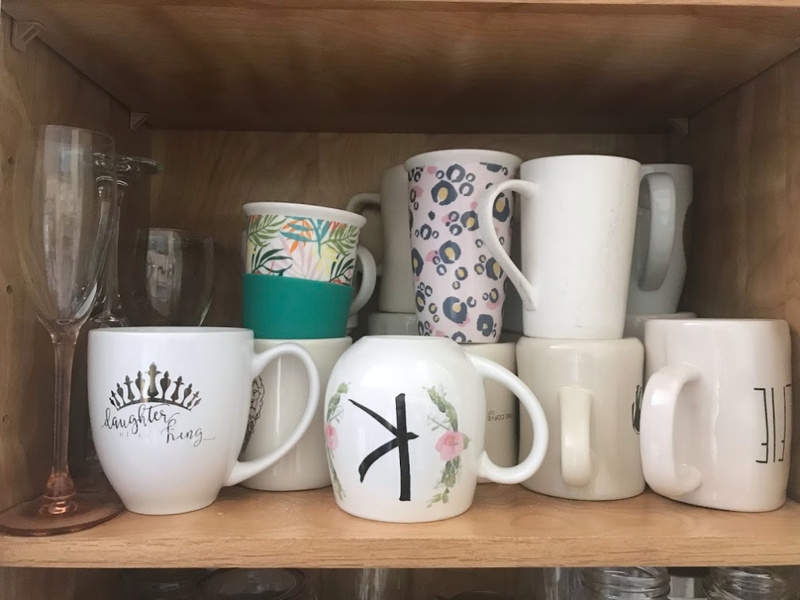 The outcome we want – which is SUSTAINABLE ORDER – requires the patience to go through the organizing process BEFORE we throw products at the problem. SUSTAINABLE ORDER requires the patience to go through the organizing process BEFORE we throw products at the problem. Your money and sanity are WORTH your patience! Write down the products you’re looking for and the dimensions you need. Now, before you head out to your favorite organizing products store, SHOP YOUR OWN HOME. That’s right! 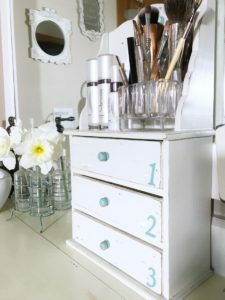 Go on a shopping spree around your home, looking with a creative eye for un-used or under-utilized items that would be perfect for your organizing project. I can’t tell you how many massive makeovers we’ve done as a team that have cost $0 in new organizing product. Not only does shopping your home save you money, it can be lots of fun! 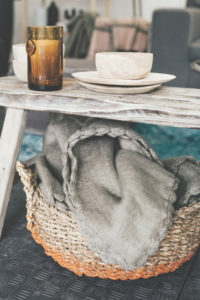 Breathing new life into your items and putting them to good use feels great and it’s good stewardship for the environment as well. 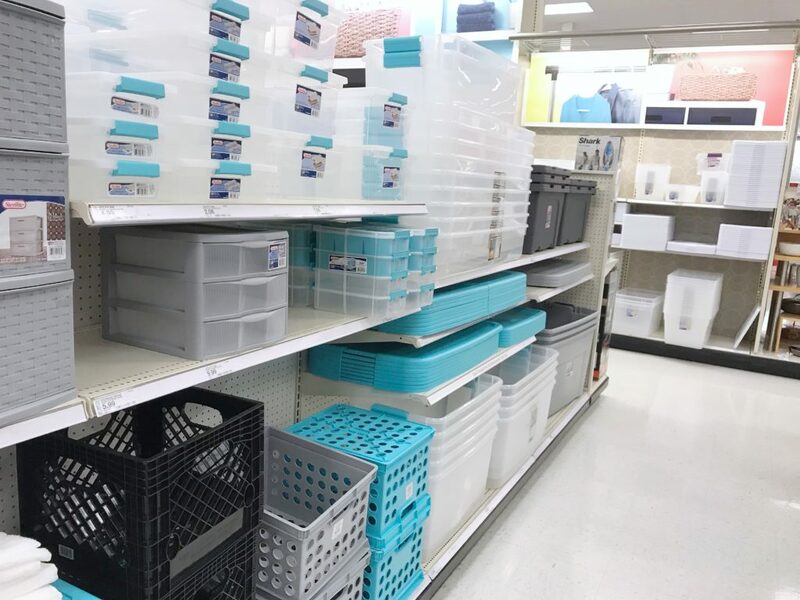 Ok, you’ve shopped your home and you haven’t found just the right organizing product for your newly established organizing system. 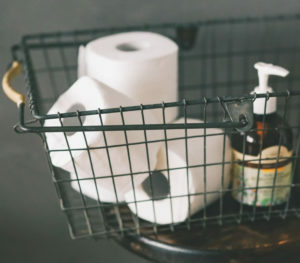 THIS is the OPTIMAL time when new organizing products should be introduced. Put in the work of actually organizing your stuff, get resourceful and repurpose your own products first. THEN begin the hunt for the best organizing products for your space. When it comes to repurposed or new containers: it’s really a personal preference. 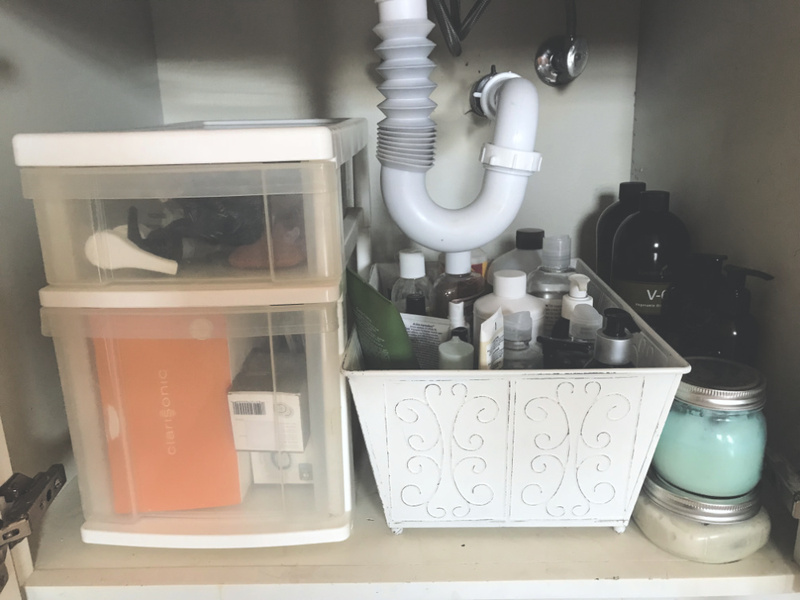 Some folks are more interested in the aesthetic of their newly organized space than cost-savings, so repurposing random containers in their home isn’t appealing. If you want all new, matching containers – go for it! 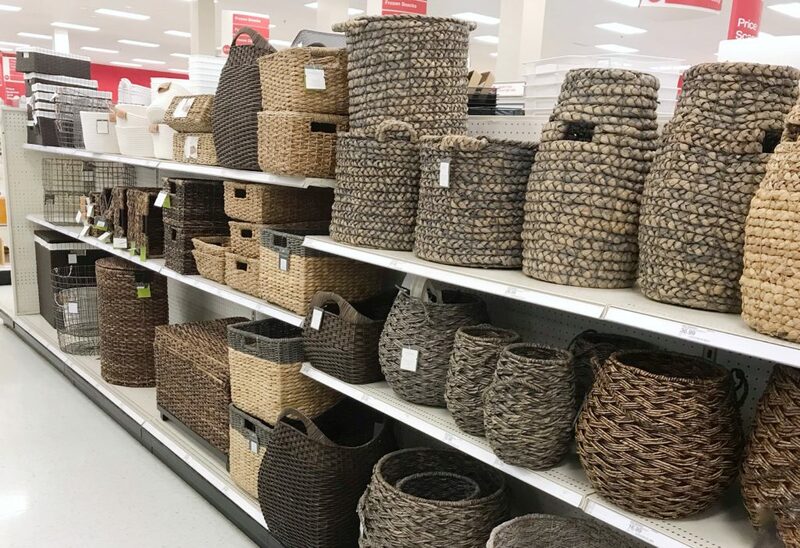 With consideration for the environment, just pass your rag-tag bins and baskets along to charity so they end up in someone else’s space rather than the landfill. It’s tempting to choose organizing products based on how they look or even how they make you feel. However, what is more important is how the product SUITS your space and organizing system. How will you ACCESS the items? Will you remove the product to use the contents or will the product be stationary? Does the product need to slide in and out easily? Do you need room above the product to retrieve items and return them to the space? 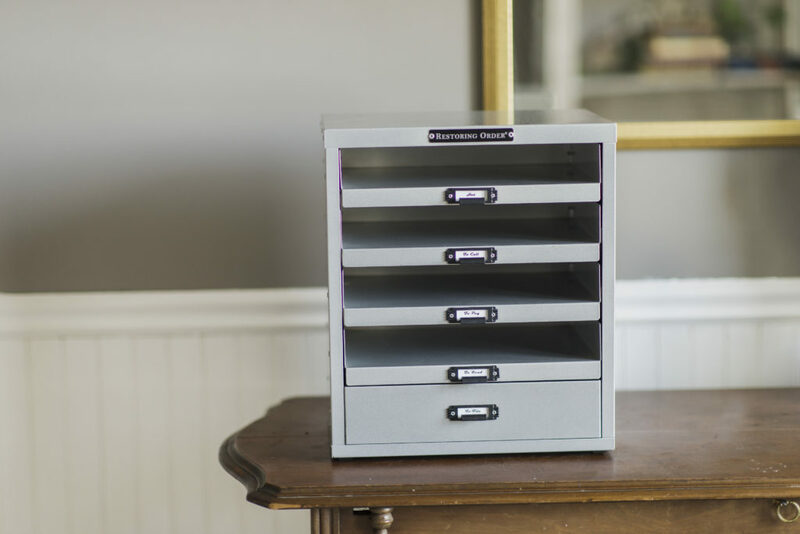 Would a lazy susan, file organizer, or drawer system be better than a bin? Where will the product live (in a closet, on a shelf, on the floor, etc)? What STYLE of item do you need? 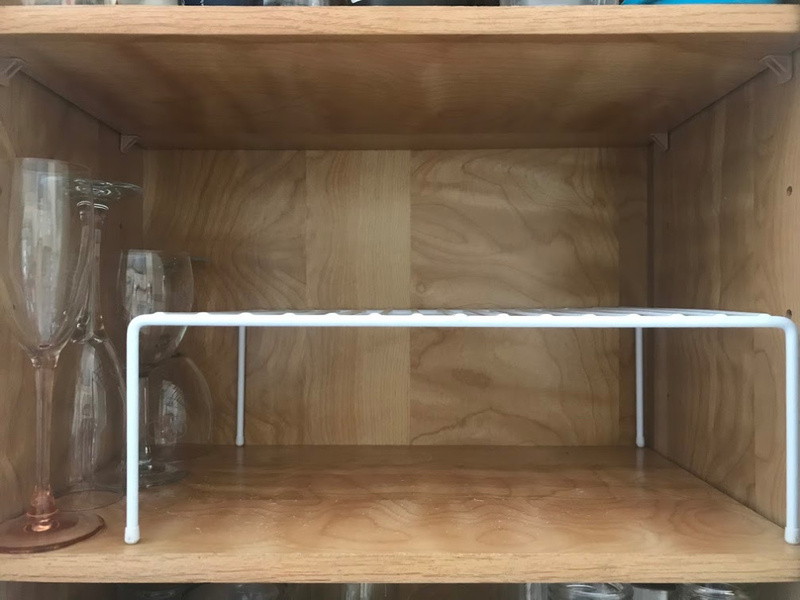 Clear vs. Opaque – consider if the items inside the container will look organized or not. Use a lid on containers with small items that could get easily lost or when there are little ones around. Also, use a lid if you need to stack containers and for items that you don’t access too often. Does the product need to be pulled or picked up? Would having a handle make access easier or cramp storage? Soft can be good for short-term storage so you can store easily between uses. Also can be great for baby and kids’ spaces (and cars!) because they lack sharp corners. Drawers – if you like things out of sight, drawers can be used for longer-term paper. For example, paper that needs to be filed could be stored in an on-desk drawer. What MATERIAL would work best? Pros: Aesthetically pleasing with many different options. Adds character and texture to a space. Opaque, so can easily hide unsightly items. Pros: Cheap, readily available, washable. Can be great for larger storage needs in garages. Can be air and water tight. Cons: Prone to breaking in certain conditions. Not as classy-looking in living spaces. Bad for the environment when disposed of. Pros: Tend to be less expensive. Light weight – good for items stored up high that need to be removed. Many different options. Cons: Least durable material of all organizing products. Tend to lose shape easily. Not great for heavier items. Some aren’t washable. Pros: Sturdy and add character to a space. Great for a natural look and better for the environment. Cons: Can be more difficult to find and can be more expensive. May snag sensitive materials depending on finish of wood. As you’re day-dreaming about the perfect fit, style, and material of organizing product for your space, don’t forget to make use of vertical space. This is one of the most under-utilized space in any home! Vertical space is one of the most under-utilized space in any home! Use a drawer systems or risers under sinks to make use of vertical space. 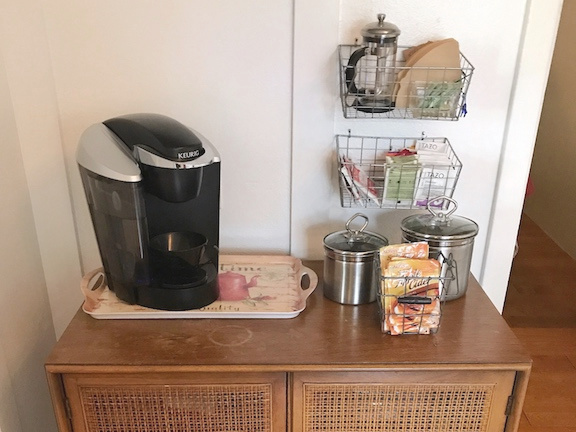 In this beverage station, we used baskets hanging on the wall to take storage vertical. Consider unused wall space when you’re looking for storage solutions! 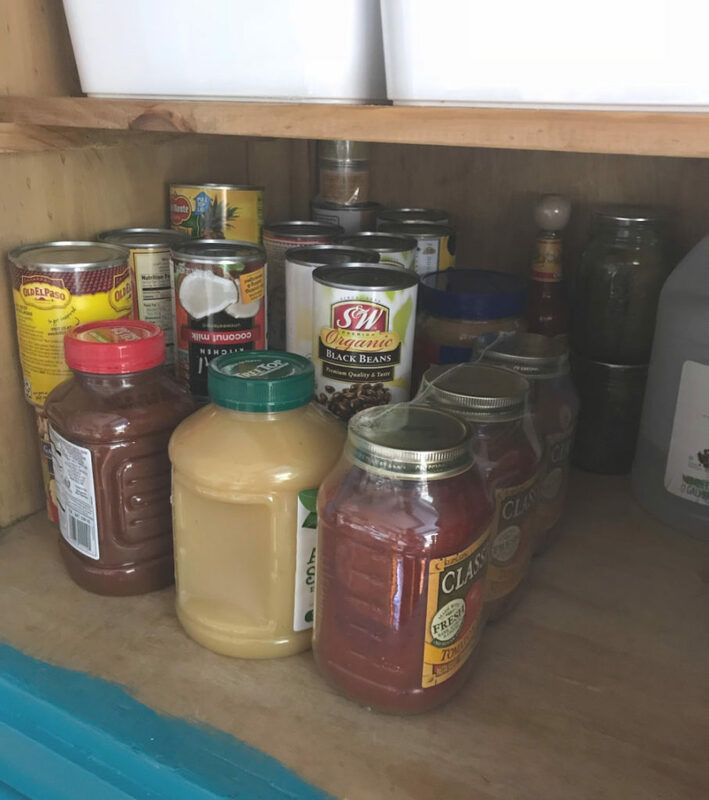 In this pantry, a canned food organizer saved space by taking cans vertical. 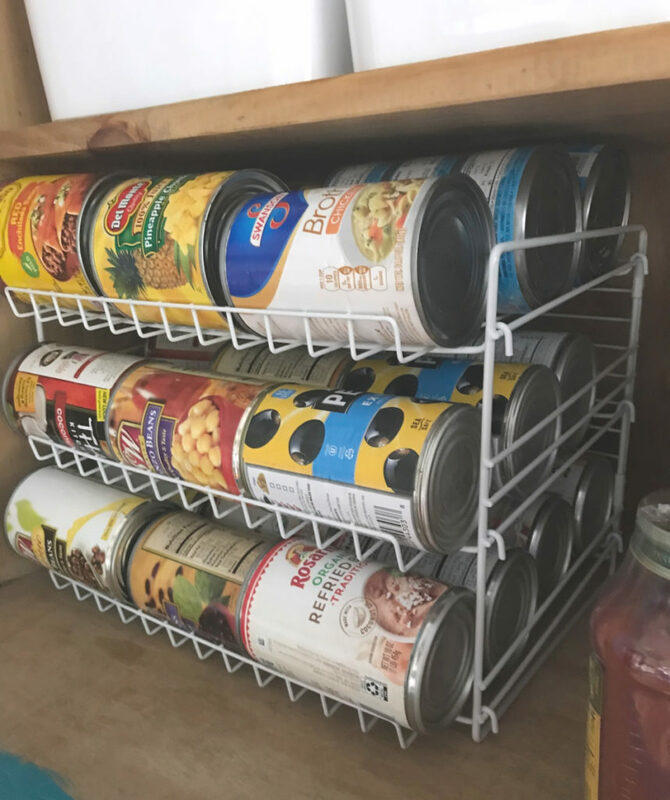 This system makes dinner prep easy because the cans are easy to grab and it’s also apparent when it’s time to buy more of an item. 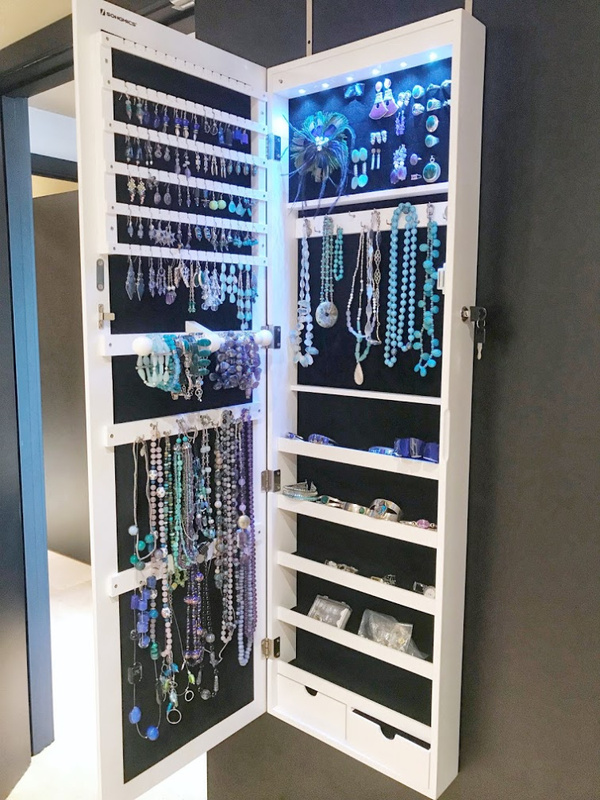 Vertical jewelry organizers are great for saving space! We love these over-the-door hangers. They are easy to mount and make use of unusable space! 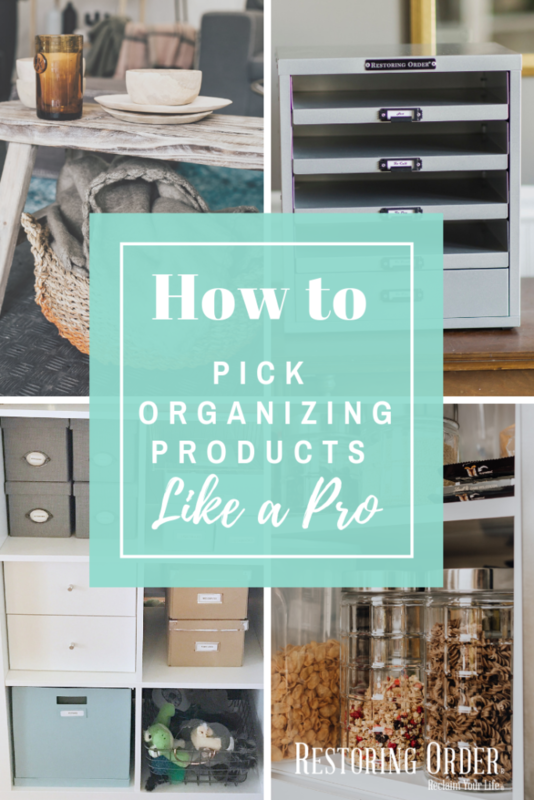 We hope that this break down of how to find the best organizing products for your projects has been helpful. Here’s to reclaiming your space and optimizing your household!